Gunnhild, known also as Gunnhild Gormsdóttir or Gunnhild konungamóðir (meaning ‘mother of kings’), is a character who is found in a number of Norse sagas. In these stories, Gunnhild is depicted as the wife of Eric Haraldsson, nicknamed Eric Bloodaxe, the second King of Norway who reigned during the 10th century AD. Whilst Eric’s existence can be ascertained (for instance, based on coins bearing his name), the historicity of his wife is more open to question, as, at present, there is only literary evidence to rely on. During the 19th century, the bog body of a woman was discovered, and was identified as belonging to Gunnhild, though this would later be proven to be wrong. 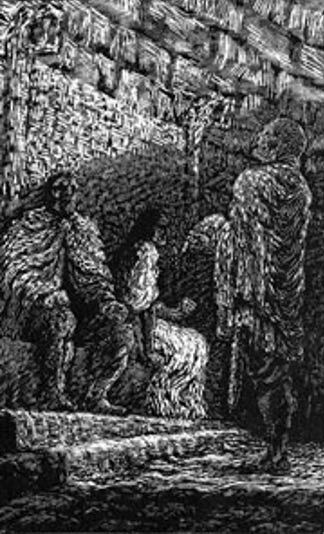 a vicious and most iniquitous woman from Denmark named Gunnhildr, the daughter of the notably foolish Gormr, king of the Danes, and of the notably sagacious woman, Þyri. A different account of Gunnhild’s origins can be found in the Heimskringla (translated as ‘The Chronicle of the Kings of Norway’ ). In this text, which was written during the 13th century AD, Erik met Gunnhild in a place called Finmark before he succeeded his father. According to this account, Gunnhild’s father is a man from Halogaland by the name of Ozur Tote. This text also states that Gunnhild was in Finmark to “learn sorcery from two of the most knowing Fins in all Finmark”. Both these men wanted Gunnhild in marriage and Erik had to kill them before he could wed her. 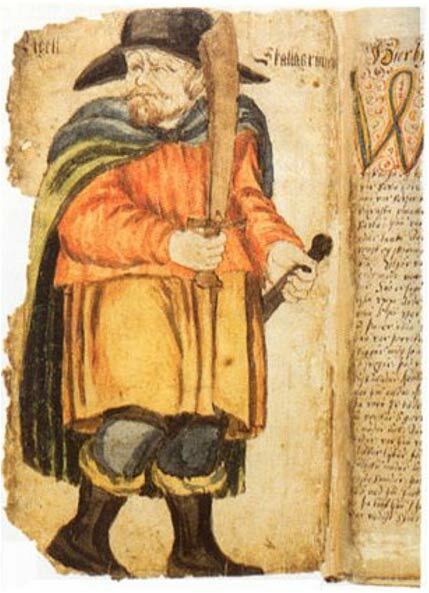 Another version of Gunnhild’s story can be found in Egil’s Saga or The Story of Egil Skallagrimsson , also written in the 13yh century AD. Like the Heimskringla, Gunnhild’s father is recorded as Ozur Tote. One difference between these two texts is that in Egil’s Saga , Erik met Gunnhild in Bjarmaland. Also, there is no mention of the “two of the most knowing Fins” in this text. After ruling for a year, and pleasing no one on account of the excessive arrogance of his wife, Eiríkr was deprived of the kingdom by his brother Hákon, foster-son of Æthelstan, king of England, with the agreement of the chief men of Norway. Eric then fled to England, where he was well-received by Æthelstan. In addition, according to the Historia Norwegiæ , he was doing quite well, until “his outrageous wife, Gunnhildr, arrived.” This text also records that Eric “died when he was attacked while on a foray in Spain”, following which Gunnhild returned to her brother, Harald, the King of the Danes, with her sons. In the Heimskringla, on the other hand, records that following Eric’s departure from Norway, he sailed west, and plundered the British Isles. As a result of an agreement with Æthelstan, Erik settled in Northumberland. Following Æthelstan’s death, his brother, Jatmund, became the new King of England. Jatmund and Eric were not on good terms, and a war between the two eventually broke out, ending with Eric’s death. When Gunnhild learned of her husband’s demise, she and her sons are said to have plundered the land of the English king, left Northumberland, plundered the British Isles for a while, and then left for Denmark, as there was enmity between this country and Norway. In the Jómsvíkinga Saga (translated as the ‘Saga of the Jomsvikings’ ), it is written that “During the winter, King Haraldr Gormsson (known also as Harald Bluetooth) and Earl Hákon planned treachery against Haraldr, the king of Norway, and his mother Gunnhildr. And in the spring he succumbed to their treachery at Limfjord”. 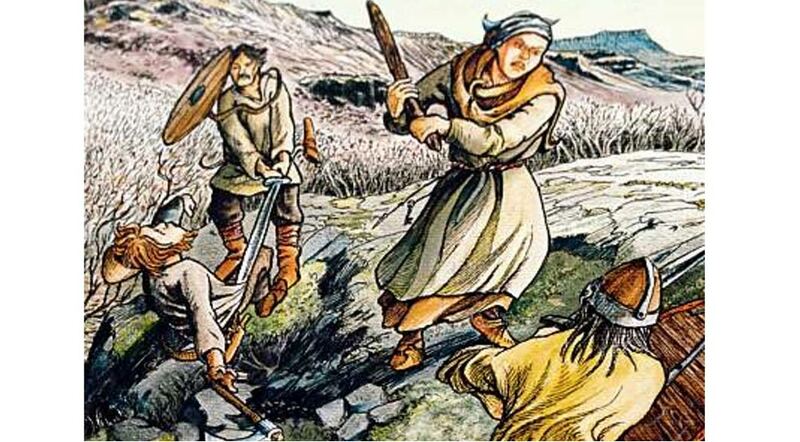 At the instigation of Harald Bluetooth, Gunnhild was drowned in a bog. In 1835, the bog body of a woman (known as the Haraldskaer Woman) was discovered in the Gunnelsmose (“Gunnhild's bog”) on the Haraldskaer estate in Denmark. It was initially believed that this was the body of Gunnhild, and the Danish king, Frederick VI, even had a beautiful sarcophagus carved for this bog body. It was only during the 20th century, with the aid of carbon dating, that this assumption was firmly disproved. According to this fating method, it was shown that this mummified body belonged to a person who lived around 500 BC, predating Gunnhild’s life by about 1500 years.